Bremen is the top team in Class 2A. Editor's Note: There are currently two No. 1 teams in Class 5A in this week's polls. One of the nation’s top high school programs, the Panthers returned just six starters from last season’s state championship squad that was named national champions by Baseball America. In 2019, the Panthers have not disappointed. Their resume includes wins over North Gwinnett, Lassiter, Mountain View, JSerra Catholic (Calif.), Lambert, Northside-Columbus, Grayson, Avant Garde Academy, Woodward Academy, Denham Springs (La.) and Norcross. The Panthers’ losses have come against Class 4A No. 1 Blessed Trinity and Class 5A co-No. 1 Buford. Parkview lost its top two pitchers from last season, but junior right-hander Miles Garrett (22 1/3 innings, 3-0, 0.94 ERA, 39 K), senior left-hander Cameron Orr (14 2/3 innings, 3-0, 2.39 ERA, 13 K) and junior right-hander Xander Stephens (15 1/3 innings, 1-1, 1.83 ERA, 19 K) have filled in admirably. Garrett has committed to Vanderbilt. Offensively, nobody may be hitting the ball better than All-American Jonathan French, who has signed with Clemson. The versatile standout is hitting .500 with three doubles, two homers and 14 RBIs. Seniors James Whitmer (.385 avg., 4 doubles, 8 RBIs), Stephen Hrustich (.350 avg., 3 triples, 4 homers, 15 RBIs) and Koby Ayala (.333 avg., 2 doubles) have performed well at the plate. The Panthers have won six state titles in Georgia’s highest class since 2000. The Bulldoggs boast as much next-level talent as any team in the state and this team is only going to get better. Winder-Barrow’s resume includes wins over Class 5A co-No. 1 Loganville, Heritage-Conyers, Peachtree Ridge, Effingham County, Evans, Lakeside-Evans, North Broward Prep, Troup and Dacula. The Bulldoggs have lost to Blessed Trinity, Bob Jones (Ala.) and Peachtree Ridge. The pitching staff has been anchored by 6-foot-8, 205-pound senior right-hander Cain Tatum (25 1/3 inn., 1.38 ERA, 34 K), a Georgia signee who starred at Prince Avenue Christian in 2018. Senior left-hander Austin Lockridge (15 2/3 inn., 2.68 ERA, 10 K) and sophomore right-hander Brady House (9 1/3 inn., 3.75 ERA, 10 K) have also been dominant on the hill. House, one of the nation’s top prospects in the Class of 2021 and a Tennessee commit, is leading the offense. House is batting .575 with two homers, two triples, six doubles and nine RBIs. Senior Zack Smith, a Mississippi signee, is batting .475 with three homers, a triple, four doubles and 22 RBIs. Senior Trace Jeffers (.474 avg., 2 homers, 6 doubles, 15 RBIs) and senior outfielder Sam Darling (.421 avg., 5 doubles) have also sparked the offense. Winder-Barrow, which has won two state titles in its history, last won a baseball championship in 1979. After finishing as the Class 5A state runner-up last season, the Wolves have proven this season to be just as good if not better than last year’s team. Buford’s early resume includes victories over Class 7A No. 1 Parkview, Etowah, Mill Creek as well as defending Class 5A champion Loganville and Class 5A power Locust Grove. They also were declared co-champions in the red division at the Perfect Game High School Showdown earlier this month. Their losses came against Loganville, Marist, Peachtree Ridge, Providence (Fla.) and Mobile (Ala.) Christian. The Wolves, however, have won six of their last seven games. Pitching has been the backbone as senior right-handed pitcher Ramsey David (19 innings, 3-0, 1.10 ERA, 28 K), senior left-hander Sean Adams, freshman right-hander Dylan Lesko (12 inn., 2-0, 1.63 ERA, 22 K, 3 saves) and freshman right-hander Riley Stanford (12 1/3 inn., 1.77 ERA, 2 saves) have pitched lights out. David and Adams have signed with Auburn and Georgia Southern respectively. Senior outfielder Evan Place (.388 avg., 5 doubles, 2 homers, 19 RBIs), senior infielder Kaleb Elder (.384 avg., 2 doubles, 7 RBIs), senior Patrick Walker (.333 avg., 3 doubles, 7 RBIs) and junior Joseph Salvo (.344 avg. 2 doubles, 10 RBIs) have been Buford’s big sticks on offense. Just because the Red Devils lost their big three pitching staff of Bay Witcher, Joseph Brandon and Seth Clark to graduation doesn’t mean the Red Devils won’t be gunning for a third consecutive state baseball title. Loganville has shown that even with a young team, the road to the state championship will go through them. The Red Devils’ early-season resume includes victories over Class 4A No. 1 Blessed Trinity, Class 5A No. 1 Buford, Class 1A Private No. 2 Savannah Christian as well as victories over Johns Creek, Archer and Wayne County. Their losses have been to Buford, Cullman (Ala.), Northside-Columbus and Winder-Barrow. The pitching staff has been anchored by 6-foot-6, 200-pound right-hander Connor Bruce, a Georgia Southern signee who has been as good as advertised. Junior right-hander Caleb Garner has also pitched well. The offense has been able to put up plenty of runs as three-year starter Dylan Strickland, a Georgia Tech commit, has been the team leader at shortstop. 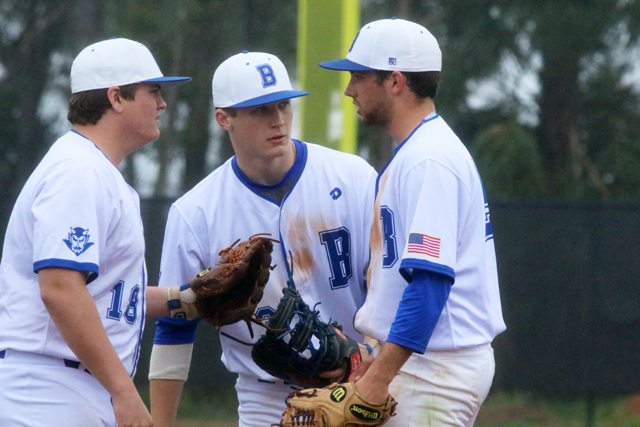 But a trio of seniors – catcher Blaine Marchman, infielder Jacob Boyd and outfielder Jackson Howell – as well as sophomore Daniel Braswell have led the way on offense. This team will only get better as the season continues. The Titans’ early-season resume includes wins against Class 7A No. 1 Parkview, Class 6A No. 1 Winder-Barrow and wins over Class 7A schools Walton, Etowah and Lambert, a trio who have claimed state titles in Georgia’s highest classification in the past six seasons. Blessed Trinity’s losses came against Class 4A power Cartersville, defending Class 6A state champion Loganville and nationally-ranked IMG Academy in the championship game of the Blue Division at the Perfect Game High School Showdown. A team full of standouts, none are bigger than senior shortstop CJ Abrams (.389 avg., 17 runs, 17 stolen bases), an Alabama signee who could be a potential first-round draft pick in the June Major League Baseball Amateur Draft. Senior outfielder Steele Chambers (.375 avg. ), who has signed a football scholarship to Ohio State, is another offensive standout who has helped the Titans put up big offensive numbers. The pitching rotation has been just as impressive. Senior left-hander Eric Moore (26 1/3 inn., 4-0, 21 K) has been strong as well as sophomore right-hander DJ Radtke (21 1/3 inn., 0.98 ERA, 24 K), who has committed to Auburn. The duo have carried the bulk of the load so far this season. The Dragons, who captured their first state title in 2018 before dropping down a class, are the last remaining undefeated team in Class 3A. And Jefferson will be tough to beat. The team’s resume already includes sweeps of North Oconee, St. Pius X and Stephens County, a trio of teams the Dragons used to compete against in Class 4A. Jefferson has already swept a three-game set from Monroe Area in region play as well as run-ruled Jackson County 14-4 on March 19. But the schedule is backloaded with three-game series against Franklin County and Morgan County during the final two weeks of the season. Franklin and Morgan are two teams expected to contend with the Dragons for the Region 8-3A title. But if the Dragons continue to hit and pitch like they have, they could contend for a second consecutive state title. Even though the team lost pitching standout Patrick Hickox, the Georgia Dugout Preview Magazine Class 4A Player of the Year to graduation, eight starters returned. The Dragons are hitting .365 as a team with Lane Watkins (.500 avg.) leading the way. Senior outfielder Sammy Elegreet (.448 avg. ), sophomore infielder Cole Watkins (.423 avg.) and senior infielder Zac Corbin (.359 avg.) have provided plenty of firepower. Jefferson’s pitching rotation boasts a 0.94 earned run average. Junior right-hander Bryce Jewell (2-0) has not allowed an earned run this season. Watkins (3-0, 1.17 ERA) and Derek Vaughn (3-0, 0.37 ERA), both right-handers, have been tough on the opposition. The Blue Devils dropped into Class 2A this year after playing in Class 3A the past two seasons. And Bremen hasn’t disappointed. With a three-game sweep of region rival Heard County, followed by taking two of three from Callaway last week, the Blue Devils are in firm control of the Region 5-2A standings. Three of their four losses have been to higher classification schools South Paulding (6A), Decatur (5A) and Cedartown (4A). The Blue Devils haven’t won a state baseball title since 1990, but this team will be expected to make a deep run this spring. Senior first baseman Jimbo Brown (.404 avg., 4 extra-base hits) and senior outfielder/catcher Brant Ivey (.385 avg., 4 extra-base hits) have been the Blue Devils’ big sticks so far this season. The pitching, led by a pair of seniors, hasn’t been bad either. Right-handers Carson Cook (27 innings, 5-0, 1.55 ERA, 36 K) and Griffin Crook (23 innings, 3-0, 2.73 ERA, 26 K) have been lethal. The Blue Devils have already bested Heard County and Callaway in region play. They defeated Lamar County Tuesday night (March 19) in the first game of a three-game set. A sweep of Lamar in a doubleheader on March 22 would put Bremen in further command of Region 5-2A. The defending Class 1A Public state champions returned 12 players who either started or received significant playing time in 2018 when Gordon Lee won its first state title since 1984. The Trojans’ three losses are a nine-inning loss to Class 3A power Ringgold, a setback to Heritage-Catoosa and last week’s 7-5 Region 6-1A loss to Mount Paran Christian. The Trojans, however, got even with Mount Paran on Monday (March 18) with a 7-5 victory. A deep pitching rotation has been the biggest reason for Gordon Lee’s success. And that rotation has them primed for another deep postseason run. The Trojans have a 2.48 earned run average with Jake Wright (19 inn., 1-0, 0.74 ERA), Logan Streetman (13 inn., 1-1, 2.15 ERA), Brody Cobb (12 1/3 inn., 3-1, 3.41 ERA) and Hunter Hodson (11 inn., 2-0, 0.64 ERA, 4 saves) throwing the bulk of the innings. Gordon Lee has used a total of 10 pitchers so far this season. Much like last year when Gordon Lee struggled at the plate early in the season, the Trojans are currently batting .274. Hodson (.455 avg., 6 RBIs) leads the offense, while Justin Wooden (.353 avg., 2 doubles, 5 RBIs), Cobb (.323 avg., 3 doubles, 6 RBIs) and Chris Potter (.314 avg., 9 RBIs) have been strong offensively. The Trojans are 15-0 and have beaten three teams currently ranked in the Georgia Dugout Preview Magazine’s Class 1A Private Top 10 – Strong Rock Christian (11-2) and (5-0), Holy Innocents’ (8-1) and current No. 2 Savannah Christian (2-0). The defending state champions who have won two of the last three GHSA Class 1A Private titles, lost their ace pitcher from last season in Luke Laskey. But junior right-hander Brooks Gorman has been tough. He is 7-0 and boasts a 0.76 earned run average in 37 innings. He has allowed just four earned runs and fanned 57. Junior righty Miles Morris (3-0, 1.12 ERA) has been solid as well. Sophomore Bo Hatcher and senior Gavin Whitfield have also been strong. The offense has been ridiculous and the Trojans have combined to outscore their opponents 149-15. Gorman (.541 avg., 4 HR, 22 RBIs), BJ Spears (.488 avg., 14 RBIs), Carter Fink (.474 avg., 3 HR, 19 RBIs) and Morris (.438 avg., 11 RBIs) are among the regulars who are batting above .450. And 2019 Class 1A Private Player of the Year Trey Ham (.375., 21 RBIs) has been excellent behind the plate.